ZOTAC Technology, a global manufacturer of innovation, is excited to announce the Grand Finals of ZOTAC CUP MASTERS CS:GO 2018 Tournament will soon kick off at the E-Sports and Music Festival Hong Kong organized by the Hong Kong Tourism Board. From August 24 to 26, the best CS:GO teams from around the world will converge in Hong Kong to battle for their share of a US$300,000 prize pool, the largest prize pool ever in the history of the ZOTAC CUP MASTERS. In addition, ZOTAC and HTC VIVE will present all the immersive VR and gaming entertainment at the Experience Zone for all attendees. The Grand Finals brings together the eight finalists – MVP PK (Asia Qualifier), Team Kinguin (Europe Qualifier), Ghost Gaming (Americas Qualifier), Flash Gaming (China Direct Invite) plus four Global Direct Invites – TYLOO, Virtus.pro, MIBR and Optic Gaming. At the Hong Kong Convention and Exhibition Centre, the quarter finals, semi finals and the grand finals will be played out in front of thousands of fans. ZOTAC GAMING will provide the official gaming system, MEK1 Gaming PC, which will power all events of the E-Sports and Music Festival Hong Kong where the PROs of ZOTAC CUP MASTERS CS:GO Grand Finals, Return of the Legends and PUBG World Invitational at the EMFHK stage, will be fighting it out. The ZOTAC CUP MASTERS CS:GO Grand Finals features talents such as the famous eSports presenter “Pala” Gilroy Sen who will host the event alongside talented casters Hugo Byron, Conner ‘Scrawny’ Girvan, caster/analyst Mohan “launders” Govindasamy, Joker and 5innn. All the action will livestream on the ZOTAC CUP MASTERS Official Microsite and ZOTAC CUP Twitch channel in multiple languages including English, Chinese, Spanish, German, French, Portuguese, Korean, Japanese, Vietnamese, Italian and Polish. The eSports blast spreads to the Experience Zone where ZOTAC and HTC VIVE co-create a VR Arena (Booth no. D01 & D02) full of excitement ranging from fierce competition, dazzling performances, to firsthand experiences. The major event in the VR Arena is Front Defense: Heroes – Asia Championship, which mark the first Asia Front Defense Tournament. Five best teams which advanced through regional qualifiers in China, Taiwan, Thailand, United Arab Emirates and Vietnam will harness the ZOTAC VR GO Backpack PC and VIVE Pro to compete live on stage for the champion title. What’s more, five different VR Experience Zones are installed for everyone to play on the hottest VR titles, including Front Defense, Final Soccer, Richie’s Plank Experience, Pingpong Kings, and Beat Saber. The experiences are powered by the new generation backpack PC VR GO 2.0, MAGNUS Gaming Mini PC, MEK1 Gaming PC from ZOTAC GAMING, Vive, Vive Pro and Vive Wireless Adapter. Immerse yourself in VR Dance Fever featuring talents from the Joint University Dance Society who will dance to the beat while playing Beat Saber, and include stunning Performances From HanzerXyria, the world ranking no.3 Beat Saber player from Thailand will prove to be a showstopper. More gaming fun in the ZOTAC booth (Booth no. C01) where you can enjoy special matches featuring local eSports players and KOL talents in the Battle Station, or even challenge them to win a prize. 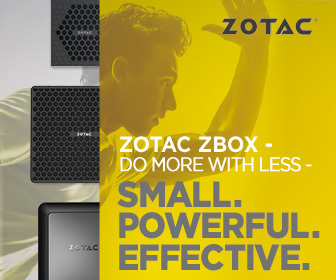 Daily leaderboards, giveaways and cool hardware displays including the latest gaming desktop from ZOTAC GAMING, ZBOX Mini PC and graphics cards await all attendees, from 10am to 10pm, and Aug 24 to 26.